Milan left us with some very clear interior design and fashion trends for 2017. Mustard yellow, or spicy mustard, is one of them. Growing up with a mother that hated this color, it took this long for it to come into my life, but now I love it! I use it as an accent colour here and there, it works great brightening up as well as a in a full takeover. It’s in my house, and in my closet. 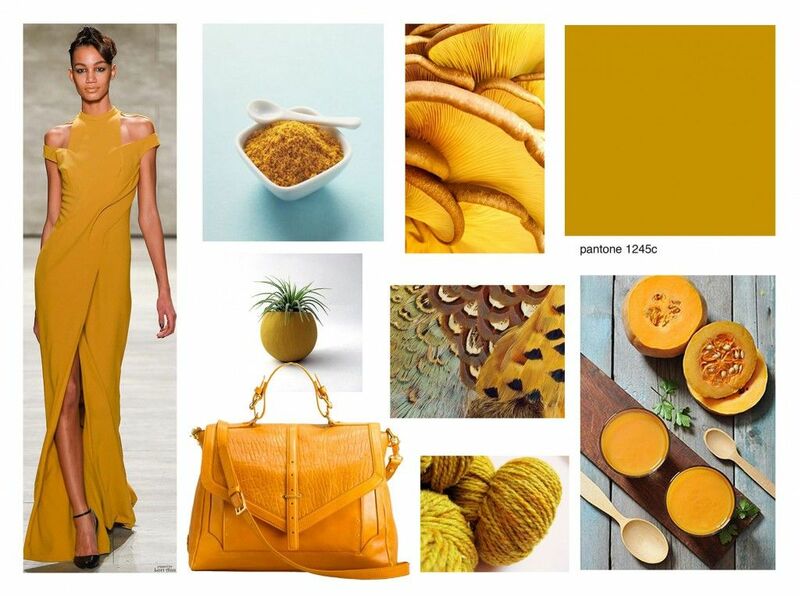 Not surprisingly, mustard yellow is also the Pantone of winter fall 17/18 in the world of fashion. I was dying to make a Mustard weave for a few weeks but it took me a while to get to the right design. I did not want something really perfect and structured, but I still wanted geometry. Most of the interior decoration I saw in this colour had very clean lines, it was very sleek and for me this colour is the essence of nature. It’s the sun when it sets, it’s the colour of many fruits and vegetables, It’s a sauce, it’s round and bumpy, it’s grainy… not cold ad square. That’s why my weave had be very organic to represent that. Muted yellow always reminded me nature, or of the fallen leaves. Autumn is my favorite season of the year. I love the slowing down after the summer and sinking into a mellow and more introspective mood. The air turns cold outside and then inside it’s time to cuddle under a blanker and welcome the winter season. The days get shorter and it’s like you are ready to go to your cave and hibernate. It’s a soothing colour but it’s also lively like the sun and and crisp like the wind brings this colour everywhere. If you don’t have a mustard piece in your wardrobe yet, or you are not convinced, have a look at this selection I made in Pinterest. You will be surprised with how versatile this colour is. 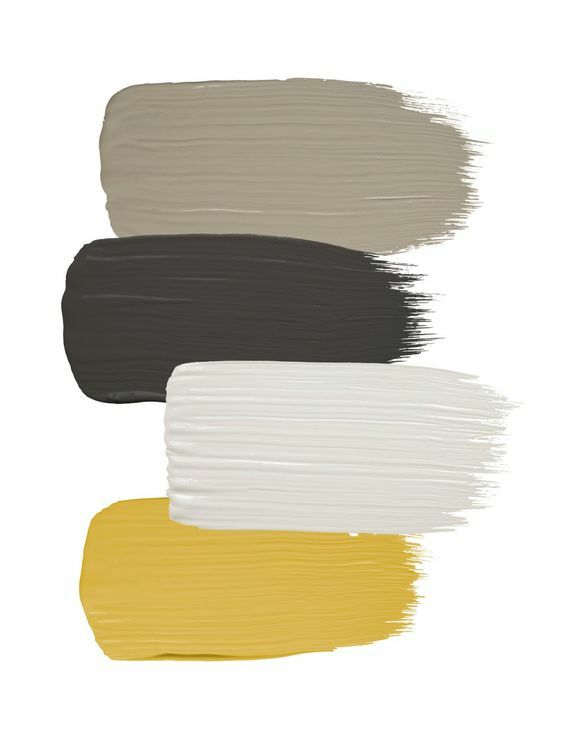 Besides being a warm colour mellow colour, It can be part of a fresh look combined with lighter shades of blue and florals. I wear it with Jeans, black and white tops, navy, dark green, dark brown, leopard and any shade of teal/turquoise. My lovely boyfriend (now husband!) the Troglodyte even got some mustard socks this Christmas. Mustard is a very bold addition to your house as well. I love to use bright colours to meke a statement over a monochrome look. That’s I did with my Chinese console below and a tassel, and that’s what I was after with this weave. 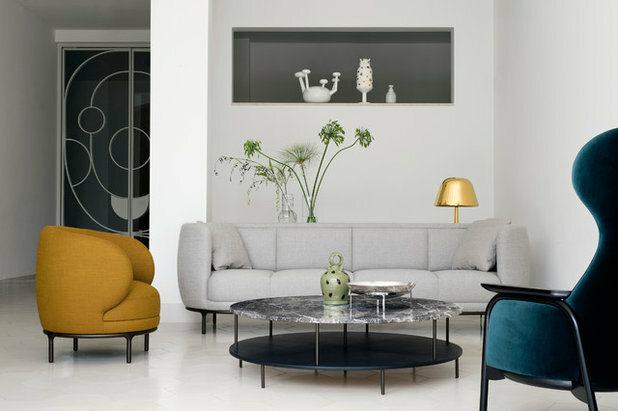 I have always been a fan of furniture design, more specifically Scandinavian design, and geometry, monochrome and accent statement colours is one of their specialties. Add baby pink or navy to your mustard pieces to see the effect go beyond black and white. 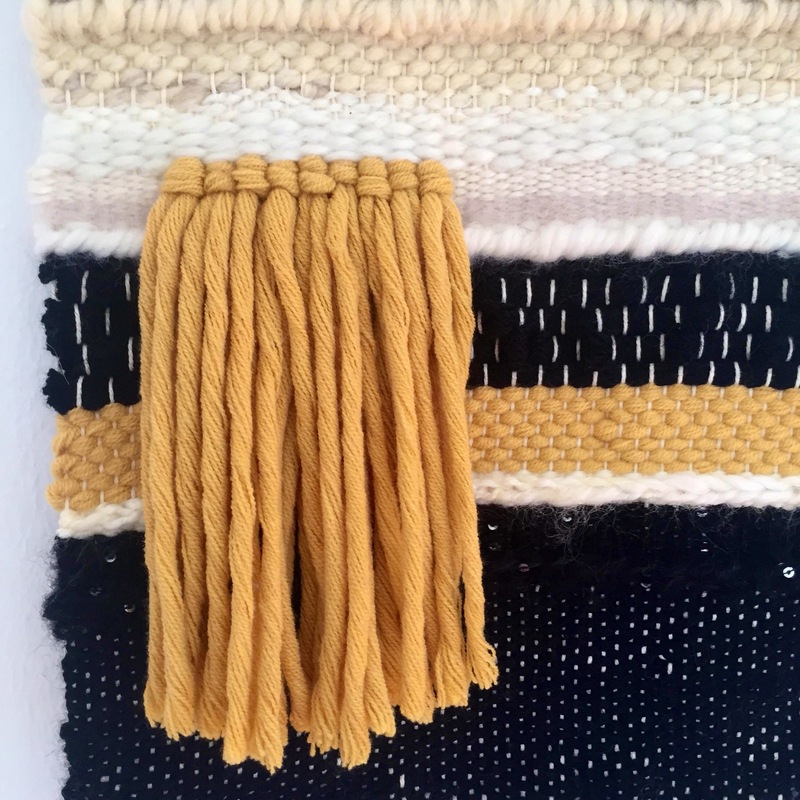 I really wanted tassels (rya, fringe) in this piece, but I wanted them to be minimal. I wanted weave tight but in an organic way. That’s why the shapes are uneven and I chose a piece of distressed wood to hold it. My only problem is that I love a little sparkle everywhere, so shimmery sequins had to be introduced. I take that little joy as creative licence. So we have creme, ivory and off white instead of pure white, black with shiny bits and of course, mustard yellow. And here we are. The result, in detail. 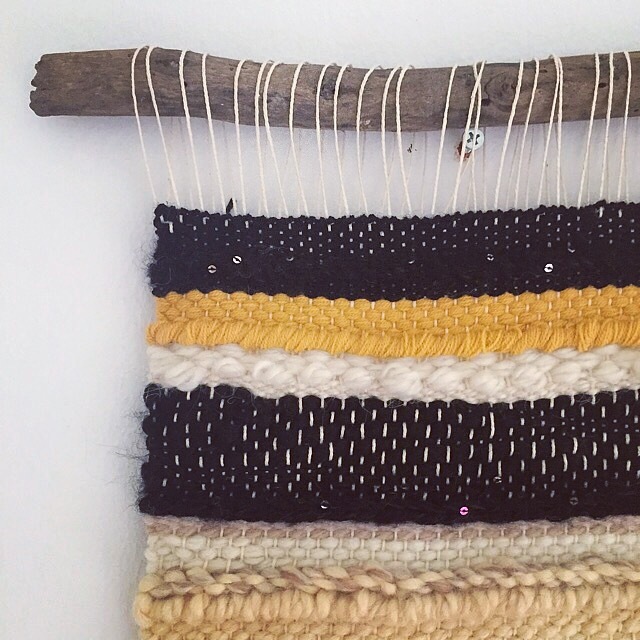 I think the Mustard weave would look amazing in a space like this. With a touch of geometry but also organic. White, greys and black, with an accent in cobalt green even better. 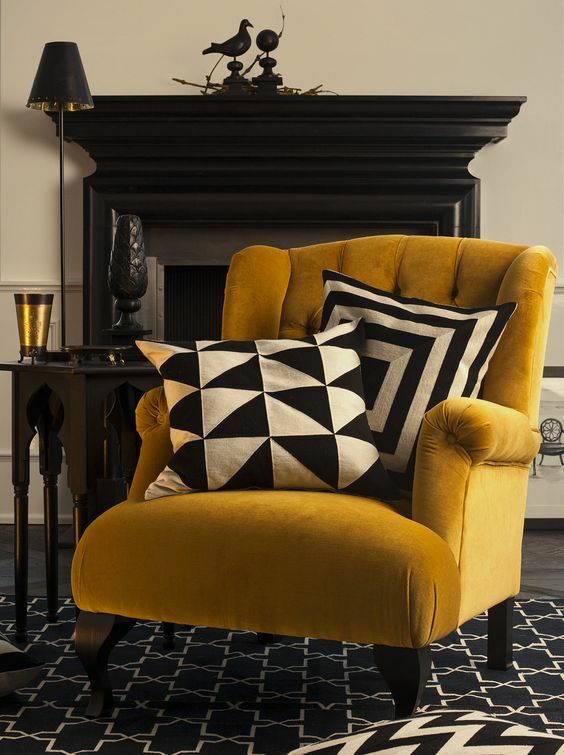 The colour of the chair is SO pretty, it might just be my next colour inspiration! Now I just have to find yarn that shade.